Some of my posts are going to be a bit out of sequence as processing video etc. takes a while, this one is from the middle of last month. I looked up tickets from Cheltenham Spa to Clifton Down, the prices were reasonable and checking another site told me wheelchair users got a discount even without a special railcard, there is one snag with the discount, you can’t book online, it’s cheaper booking online than at a station so I ended up paying slightly more. I also checked the accessibility of the stations online, all had access to street level from the platform and ramps for the trains, so I sent Mum to the station to book. You are advised to book in advance and also to let the station know you’ll require a ramp, this makes a spontaneous journey difficult, but oh well. The day arrived and my nerves started, we arrived at the station and were spotted by a friendly member of staff who asked if I was Mr Baker, he then lead us to the platform and then went off to get the ramp. The train arrived and the foldable ramp was attached, it was rather steep and only just wide enough for my chair but I managed, after getting on board there was a left turn into a short corridor, this was narrow too and my elbows were touching each side as I drove in, the wheelchair space in the carriage itself was also rather small, I got in at an angle without blocking the aisle too much. Looking out the train window calmed the last of my anxiety and I watched the countryside rush by. We arrived at Bristol Temple Meads and exited the train, going down the ramp forwards showed just how steep it was, I’m glad I had my chest belt on! We were guided again to the next platform, which was good as I suspect we’d have had a tough time navigating the lifts etc. on our own. 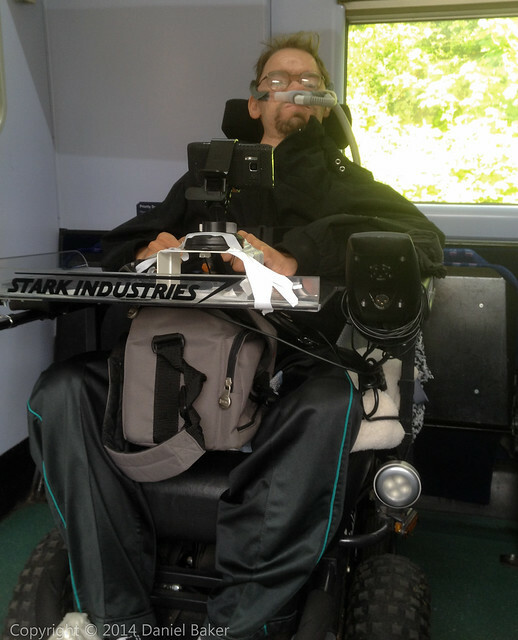 This train was better, a large entry into a spacious area just for wheelchairs, I could even recline my chair making the journey much more comfortable. Getting off the platform at Clifton Down was easy, a nice long ramp to street level, the zoo was signposted clearly so we didn’t really need the map I’d printed out the night before, it took us around forty minutes to reach the zoo, this could likely have been halved if Mum didn’t have a bad back and wasn’t dragging my spare ventilator in a suitcase behind her. We dropped my spare ventilator off at reception and collected the mobility scooter Mum had booked then set off to explore the zoo. First of all we headed to the lorikeet enclosure, the doors had a push button for disabled users, we pushed it a couple of times but nothing happened, a kind stranger ended up helping Mum with the doors and screens. Insidewas warm with lots of trees and a jungle feel, we bought some nectar and fed the lorikeets, they had no fear and happily landed on my chair and hands. After the lorikeets we headed to the butterfly forest, the heat and humidity really hits you in there, it was lovely watching the butterflies and I managed to get a couple of good photographs as they were feeding on fruit. Next was the gorillas, they are awesome, the enclosure has a glass ceiling where you can see the huge silver back walk above your head, then on to the Lemurs, there was a talk going on and we got to see the crowned lemurs on their first day in the main lemur enclosure. The rest of the zoo was a bit of a rush as Mum kept reminding me we couldn’t miss our train, we saw penguins, seals, monkeys and other animals before leaving. The return to the station wasn’t as well signposted but my sense of direction held up and we returned without getting lost. We waited about fifteen minutes for the train, this time the wheelchair section had two bikes in it so we were told to just stay in the corridor, Mum had to remain standing which was far from ideal. 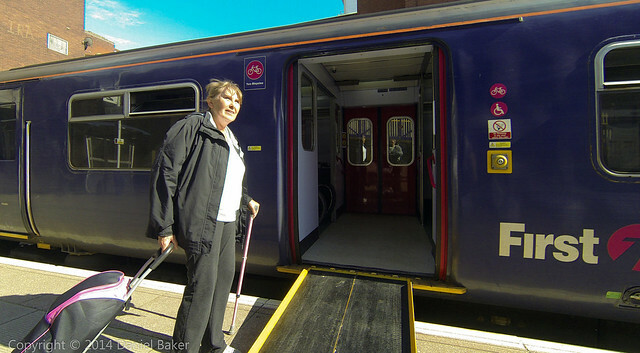 We arrived at Temple Meads again and changed trains, this time my chair wouldn’t fit into the carriage so I had to stay in the corridor next to the disabled toilet, even that was tight with other passengers struggling to get passed, Mum again had no seat and had to sit on the floor. So was the train a success? Nope not really, I just managed to get on and I did like the experience, but it’s no faster, cramped and no easier for Mum, if I could guarantee I’d get the second type of train every trip and that the disabled carriage wouldn’t have bikes in the way I would consider travelling on the train again, as it is it’s just too much hassle. I will say this though, things have improved since I was a teenager, at that time disabled passengers had their wheelchairs lifted into the guards van and had to sit in that rather smelly and uncomfortable area for the whole trip! This entry was posted in Outdoors and tagged accessibility, Bristol Zoo, Duchenne, First Great Western, Frontier X5, Muscular Dystrophy, railway, train, travel, wheelchair. Bookmark the permalink.